I’m having a well earned day of rest after an extremely sociable week with Mama J’s friends all wanting a piece of me. I now know what it must feel like to be a member of our Royal Family. I bet The Queen just fancies staying home, putting her feet up and having a brew while watching Coronation Street or we’d better make that Eastenders seen as she’s a London girl at heart. There has been a whole lot of chatting from me in my own unique and uncompromising barking manner as I said, “Hello” to all of our lovely visitors. Firstly it was one of Mama J’s lovely work colleagues who kindly stated that I looked so much better than the last time she saw me. That isn’t difficult as unfortunately I had the last of my funny turns (not of the writing kind) in front of her before I went on my Epiphen. Her and Mama J hit the shops and particularly Marks and Spencer’s with outstanding gusto. Mama J spent £97.70 (that was with a 20% discount for having a loyalty card) on two shirts, two scarves, a pair of stripy trousers that Mama J believes inspired Gok Wan’s This Morning fashion segment (he was obviously there in spirit) the next day and three packs of underpants. Now about those pants. As Granny pointed so bluntly out, “You have a draw full of pants!” I’m going to really put my paw in it here by telling you all a little Mama J g-string sized secret. She had pants going back almost fifteen years old at one stage. These pants could have ended up in The Tate Modern okay change that name to The Tate Olden Museum as they were walking relics of 1990s fashion and seen as they were from the now ill-fated BHS, it makes them even more of a historical piece of fashion wear. Anyhow Mama J ditched those pants a few years back and now invests in all new knickers every year. Bravo pantyhose! As well as shopping there the pair enjoyed the best hot chocolate Mama J has ever tasted in Hotel Chocolat. I think she could’ve written a fine review of this product (and got paid with more hot chocolate in the process) as she’s been talking about its creamy texture and wonderful sweet but not too sickly taste since last Monday. The day after the shopping trip Marks and Spencer’s new Chief Executive Officer was on the TV talking about rejuvenating the clothing side of the brand (the food side is fine thanks to Granny buying chicken pie and frites in there on a weekly basis). He was asked who is Mrs M&S and his response has caused ructions in the Chelton household ever since. Apparently Mrs M&S is a lady in her 50s (Mama J’s shopping companion fits that styling bill as does Granny). There’s Mama J been more than happy with the addition of Alexa Chung’s input with the brand as it made her feel positively trendy shopping there. However oh dear this new retail mindset has compounded the notion that Mama J is in fact Grandma after all! Seen as she is a strong minded woman of the World (well, our village and possibly the nearest town) Mama J has decided to carry on shopping in M&S in the knowledge that one day she will be in the age bracket they are tailoring their clothes to. Mama J’s wanting to start winding the clock forward and well and truly cheering the ageing process on. Our next visitor was on Monday evening when Mama J and Granny’s hairdressing and married duo came around for tea. Our friend is in the late stages of pregnancy at the moment and Mama J had already offered her services as a “Midwife” when Granny invited them over. 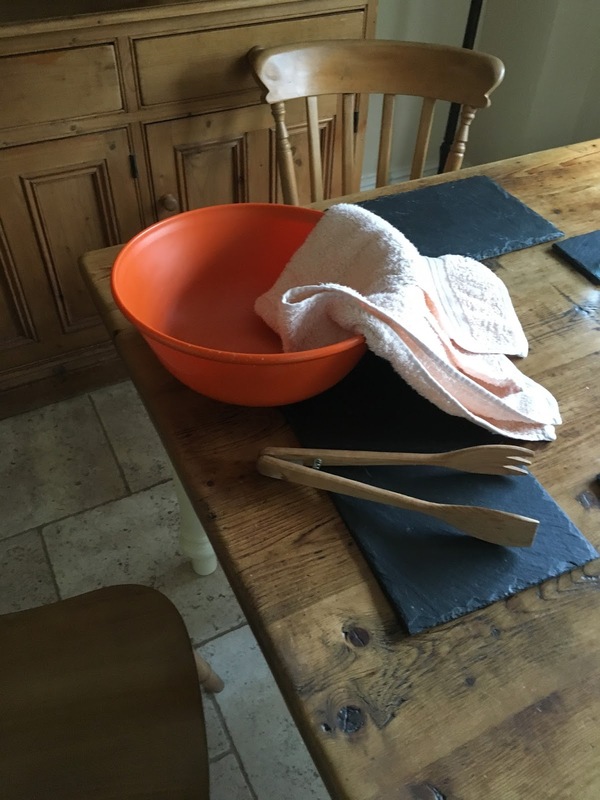 Mama J did a mock up photo of a plastic bowl (usually used for the Yorkshire Pudding mix and the occasional splattering of sickness, not following the Yorkshire puddings may I add as Granny’s cooking is always impeccable) alongside a towel and a pair of wooden salad tongs (just in case forceps are required for delivery) and text the amusing image over to our friend who nearly went into labour at the sight of the message. Mama J’s credentials as a Midwife are that she was Majax (major incident) trained when she worked at the local hospital. Now you maybe thinking she is medically trained but oh no she worked in Medical Records and on few numbers of the hospitals busy reception desks including importantly the Antenatal desk. Casualty’s Connie Beauchamp this girl isn’t! She hasn’t watched Call The Midwife but has been enjoying Kay Mellor’s brilliantly written pregnancy/baby related drama In The Club. Anyway our friends enjoyed the dinners and left with baby still very much on board and inside Mum-to-be. Phew as think I would’ve had to take myself off for a long walk with Mama J in tow, as did I mention she’s ever so squeamish? Deliver a baby, yeah right! Mama J’s last visiting friend was a former work colleague who is now a trained officer of the law (a Police Officer I was trying to make her sound more like RoboCop). She came over for a brew and a chat and to show Mama J her new Mazda MX5. It looked like a very classy and sporty motor indeed. She took Mama J for a Top Gear style spin sadly not on a race track like the Mini Cooper Chef Gordon Ramsay drove on last nights show, (Mama J is now poised ready to see what her Mini Primrose can really do) however a little sedate ride down the road and then around the block. It gave her a taste of its drive and handling and Mama J was most impressed that at 36 years old she could still get in and out of the sporty number with great ease. Those stretches she’s been doing every night have definitely paid off. 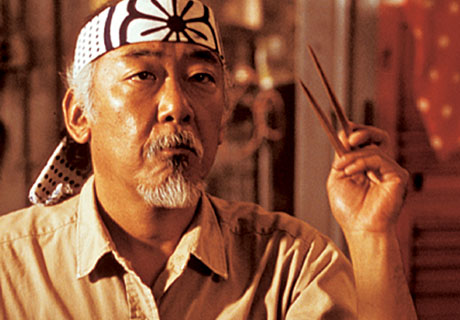 This brings me on nicely to Grandpa or should that be Mr Miyagi? He has been going to a Karate class with a friend and his friend’s teenage son on a Saturday morning and this weekend he took it a reverse roundhouse kick too far, for his back! Yes, he’s been in traction virtually ever since and is walking around like he’s done something extremely unsavoury in his pants. He should’ve remembered to wax on wax off before he started doing his kicking manoeuvre and most importantly he should’ve remembered that he’s now in his late 50s and not late teens anymore. 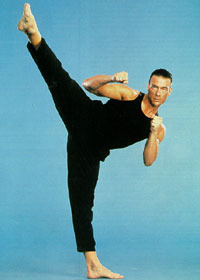 Even Jean-Claude Van Damme would be hard pushed to pull off some of his Hard Target and AWOL moves these days. Ouch poor Grandpa!